Occasional Cakes are perfect for your event. Choose from birthday, graduation, or baby shower themes. 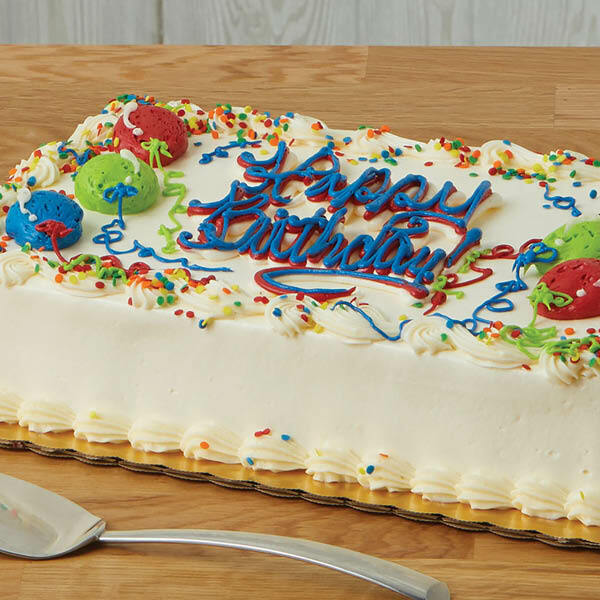 These cakes are made fresh to order and available for pick-up within 72 hours of order. Need a cake tomorrow? Check out our Carl's Classics. Can't find what you're looking for? Fill out our custom cake inquiry form here. Choose the graduation decorative theme and select your school for a graduation cake decorated in your school colors. *Edible image not available on 8" cakes. We will decorate your cake in your school colors! *Do you or your guests have any of the following food allergies? *Please indicate the allergies of you or your guests. 72-hour advance notice is required. These cakes are tried-and-true combinations sponge cake, tasty fillings, and our signature Carl's Cakes house-made buttercream frosting. Looking for something different than the available options? Click here and fill out an inquiry form to start creating your dream cake today. Our kitchen is not an allergen-free environment. Please notify us of any allergies. Please be aware that during normal kitchen operations involving shared cooking and preparation areas the possibility exists for food items to come in contact with other food products.